Focusing on Annie, we learn of the root of her problems. I love love love Julia Garner. She is great as Ellie. But why is their dad living in a robot? I saw the contraption more as a pod. The brand on it spells "A-void"(!). 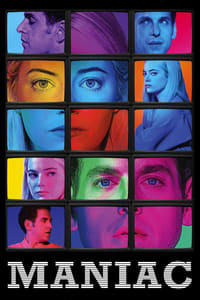 Den of Geek review - Emma Stone gets a showcase in Maniac's improved take on its own beginning. I thought of it as a sensory deprivation tank, though that shouldn't be a prolonged environment. I watched the first two episodes of this last night, and I'm still not sure how I feel about it. I love surreal genre TV so this should be right up my alley, but both episodes dragged for me, and some of the quirk felt forced. I sort of felt the same way at that point, showbiz_liz. I stuck with it anyway, and did not regret it in the slightest. I continue to be blown away by the production design. The computer conttol room was so full of (what looked like) practical (as opposed to cgi) blinky lights. It gave me set design squee. I'm loving it so far. Everyone gathered around the table finally gave me the Alien vibe that someone picked up on last episode, and Annie's present and past make the character a lot more empathetic even as she does not-nice things, such as blackmail Patricia for drugs. I even like some of the unanswered questions, such as: Is/was the dog in the flier real? Is Annie's sister still alive? And why isn't Friend Proxy a thing? So, I saw a "you have a daughter named Usnavi that goes to Hunter College" caption in the first ep, and I figured it was just some walla. But now we know that Emma Stone's character said it during a threat. Lin Manual-Miranda played a character named Usnavi in a broadway musical he did the music for named "In the Heights". The character was so named because his parents saw a US Navy ship when deciding on a name for their baby. Also Lin and his wife went to Hunter College for high school. There is a zero percent chance the reference was not intentional.